Here's a sweet, versatile peasant style top to complete your retro outfit. Wear it with a circle skirt for a classic sock hop or rockabilly style, pair it with a pencil skirt and wear it off the shoulders for a retro bohemian bad girl pin up look, or match it with a peasant skirt or bell bottoms for a groovy 60s hippie flower child outfit. This peasant style top has a gathered elastic neckline and puff sleeves. It's sized generously to fit a range of sizes. 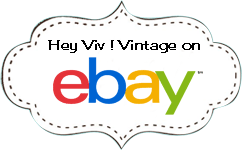 A Hey Viv exclusive! Adult Small/Medium Bust: 38 - 42", Waist: Free, Length: 24"
Adult Large/XL: 42 - 46", Waist: Free, Length: 25"
*SIZING TIP: The bust measurements given are the measurements of the shirt itself laid flat and measured from seam to seam. The lowest number for each size is the measurement of the top unstretched (the fabric has some stretch to it). Keep in mind when choosing a size that this style is typically worn somewhat loose.